NOTE: I'M CURRENTLY (AS OF MID-2014) TAKING A BREAK FROM PLAYING BANDONEON, ALTHOUGH I'M STILL INVOLVED WITH OUR LOCAL COMMUNITY ORCHESTRA (LOFT) AS THE EXECUTIVE PRODUCER!!! Cristina will tell you that it's no secret, Homer spends almost all his free time learning and playing the bandoneon (since October of 2009). You can read more about the details of his learning process via his Bando Blog. One of Homer's life goals is to help grow and sustain tango in the future. He believes that a key path to achieving this is to promote great live music for social tango dancers to enjoy dancing to. Thus, learning how to play the bandoneon is both his hobby and his not-for-profit social outreach. To this extent he is a strong promoter of tango groups that are highly danceable. In addition, Homer has been conducting free tango jams on many of his travels since 2008. Starting in 2013, he has been developing a Project Tango sponsored local SF Bay Area community orchestra. After much thought, the decision was made to look into the re-emerging craft of bandoneon making in hopes of buying a completely new instrument that will out-last Homer by at least several decades. 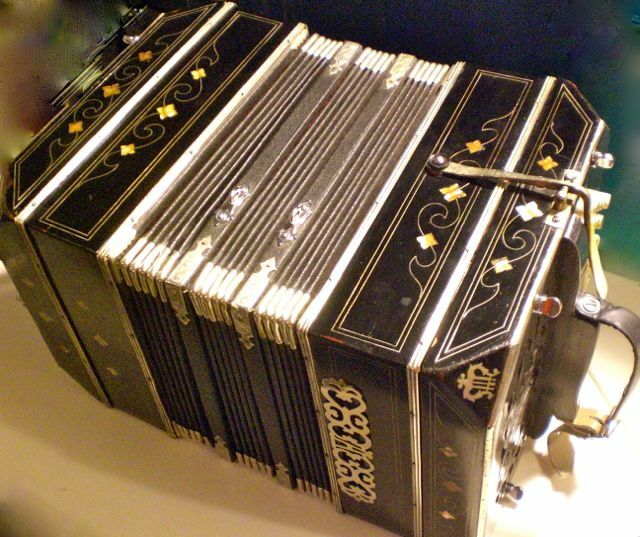 There are several contenders in the field including the following bandoneon builders/manufacturers. If you'd like to help Homer on his mission to acquire a new bandoneon, feel free to make a donation!! !